As part of the Describe Project, several Author and Scribe groups were established in branch libraries the County of Longford. These writers groups, with children and adults writing together, are at the heart of Describe. The autonomous, self running groups meet either weekly, or fortnightly from the end of September to mid April each year. Numbers vary in each group and in each year. The biggest group being eighteen adult and thiry children. The Author and Scribe groups use the same "Story Inspirations" that are available from the Describe CDROM or downloadable here. So what happens at an Aurthor and Scribe Group? The librarian has laid out chairs, paper and pencils, photocopied the Story Inspiration sheets and the group is ready. There are parents, grandparents even a teenage sister. Some scribes have one young author; some have two who will share in the making of a story. Ages range from five to ten. This is not one of the occasional sessions where Chris, the project facilitator is visiting but the group can be sure that there will be an exciting "Story Inspiration" ready for them. Tonight's theme is pirate treasure. This story Inspiration tells a story of the finding of a letter in a library visited on a wet day spent on a holiday island. There is even a strange old map. The children are full of ideas about how the map got there and what it might mean. Now the young authors are ready to ask their scribes to help them. They each take a copy of the map of an island. First they will put in all the details onto the map to make it their own. This gives lots of opportunities to talk about the setting of their story. Scribe and author(s) both have ideas and there is lively enthusiastic communication. There is a real work buzz in the library. Soon they are ready to start the story. Some scribes write directly onto the special story sheet. Other scribes have plain paper or a notebook so that a fair copy can be made later. Everyone is busy, absorbed in story making. The hour flies by and it is almost a pity to stop everyone but it would be a great shame not to hear all the stories. Everyone is different. Some have decided to be the pirate who buried the treasure. Others are off on a treasure hunt. They are all highly imaginative with lots of different narrative viewpoints Authors and scribes are all proud of their stories and all but the youngest Authors introduce and read their own stories Everyone has had a great time and more new stories can be added to the special story book box made for the group by Chris. Children and adults together writetogether. 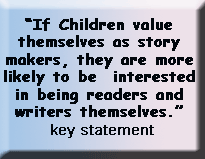 It becomes possible to run children's writers' groups with the full involvement of parents and teachers. WOULD YOU LIKE SOME TIPS ON SETTING UP AN AUTHOR AND SCRIBE GROUP?